Veteran Websites - Affordable websites for veteran organizations. 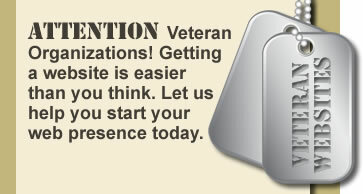 Veteran Websites offers attractive websites geared specifically to non-profit Veteran organizations. We offer website packages that allow your organization to share information, promote events and attract new members. Choose from packages that include free website templates or a custom website design at an affordable price. Have separate web pages for Veterans, Ladies Auxiliary, Officers, Home Association, etc. Complete websites start at only $99.00 per year for our standard website templates, plus a one-time setup fee of $90.00 to place your website content. This is a great opportunity for your post to begin its presence on the world wide web. Website Design and Content © 2010 - VeteranWebsites.com, a Veteran Owned Company. All Rights Reserved. All veteran organization logos and names are trademarks of the corresponding organization. Website Hosting Provided by First Capital Web Services, a Veteran Owned Company.